Heat oven to 400°F. In 12-inch skillet, heat oil over medium heat. Add chicken, mushrooms, onion, salt and pepper. Cook 8 to 10 minutes, stirring frequently, until chicken is no longer pink in center. Remove chicken mixture from skillet; set aside. In same skillet, melt butter. Stir in flour with whisk. Cook 2 to 3 minutes, stirring constantly, until bubbly. Stir in wine and broth. Heat to boiling; reduce heat. Simmer until sauce is thickened. Add chicken mixture to sauce. Stir in mixed vegetables; heat until hot. Pour into 9 1/2- or 10-inch glass deep-dish pie plate. Remove pie crust from pouch; unroll crust and place over chicken mixture. Seal and flute edges. Cut slits in crust. You can omit the wine and increase the amount of chicken broth to 1 cup. Place the foil-wrapped pot pie in a resealable freezer plastic bag; seal tightly. Label and include the date so you know how long you can store it. 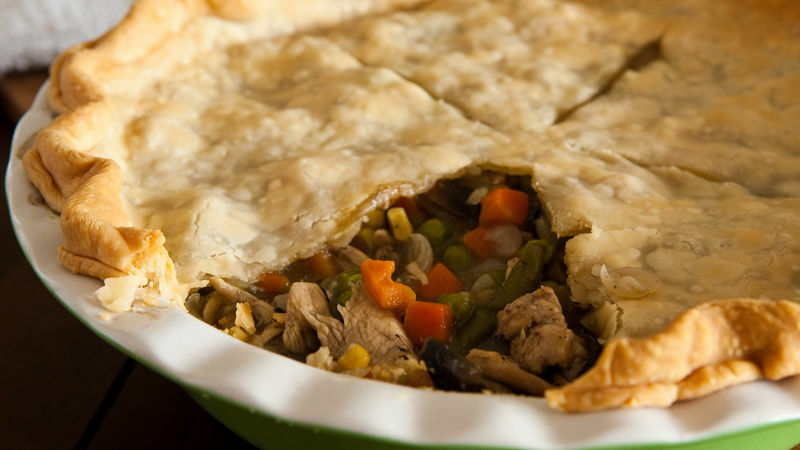 Refrigerated pie crust can be frozen up to 2 months; or if planning to make the pot pie ahead, wait to purchase the refrigerated crust until ready to bake. Prepare recipe as directed—except do not cover with crust. Pour chicken mixture into pie plate. Cover tightly with foil; freeze 2 to 3 months. Freeze pie crust separately. Before baking, thaw overnight in refrigerator. Heat oven to 400°F. Place pie crust over chicken mixture as directed. Bake as directed, adding 5 to 10 minutes to baking time.